Shelter Island volleyball is back and the teams are on the right track. In action since August 20, Shelter Island’s volleyball team has 24 athletes between the varsity and JV squad, with the potential of two others joining now that school is in session. BEVERLEA WALZ PHOTO Domily Gil, left, received congratulations from Sarah Lewis and other teammates after her inside the park home run April 20 against Center Moriches. GARRET MEADE PHOTO | Kelsey McGayhey, who is one point shy of her 1,000th career point, taking aim while Pierson/Bridgehampton's Rachel Saidman (5) and May Ejven try to stop her. The countdown to 1,000 points — and the drama — continues. Kelsey McGayhey’s career point total sits at 999 points after the Shelter Island senior scored 20 in a 37-30 win over Pierson/Bridgehampton in girls basketball on Tuesday night. With the win at Pierson High School, their seventh in eight games, the Indians (8-4, 6-2 Suffolk County League VIII) clinched a playoff berth. But the big question of the night was whether or not McGayhey would become the first Shelter Island player to reach the 1,000-point mark, something she is anxious to achieve. McGayhey said she felt pressure before the game. Her parents had invited friends to the game, she said, and she noticed that a few news organizations were present, ready to record her 1,000th point. Then, after the opening tipoff, McGayhey experienced a different sort of pressure: Pierson/Bridgehampton’s box-and-one defense. GARRET MEADE PHOTO | Haley Willumsen of Shelter Island, tangling with Pierson/Bridgehampton's Abby Ruiz, collected 11 rebounds. 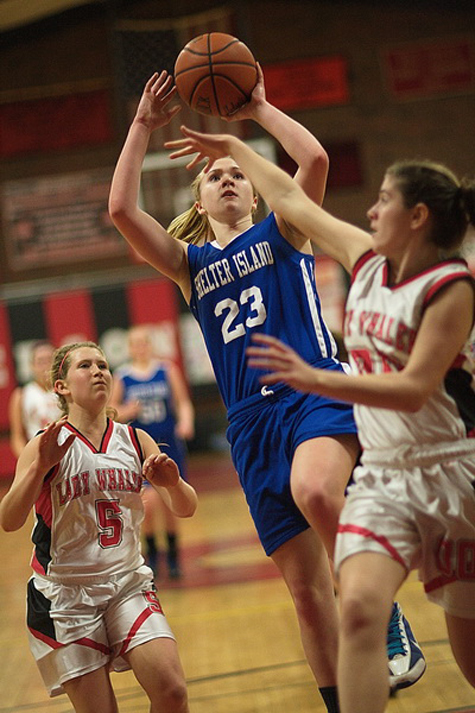 Whenever McGayhey received the ball, two and sometimes even three Whalers smothered her, determined to prevent the Shelter Island star from reaching the milestone. McGayhey sank her first three shots, but had only 6 points by halftime. The 5-foot-11 center didn’t force things, though, and passed to open teammates. It wasn’t a bad shooting night for McGayhey, who went 10 of 15 from the field. She did not take a foul shot. Now McGayhey must wait until Friday when Shelter Island will play its next game at The Ross School. The way the game started, it looked as if McGayhey would easily reach her goal. 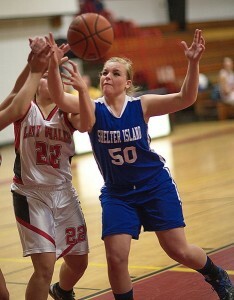 She banked in a layup in the opening moments and scored 6 of Shelter Island’s first 8 points. But those remained her only points until the third quarter. When McGayhey headed to the bench with 49.3 seconds left in the second quarter for her only breather of the game, she had an unhappy look on her face. The ball wasn’t in her hands much in the first half. Then things opened up for her a little bit in the third quarter. She drained a turnaround jumper from the foul line, converted an offensive rebound, made a layup, and got a ball to bounce in off the rim, leaving her with 14 points after three quarters. A layup in the fourth quarter brought McGayhey her final points with over a minute left. It was her last shot. Shelter Island called a timeout with 16.5 seconds to go, undoubtedly with the aim of setting McGayhey up for one final shot, but the Indians turned the ball over and it never materialized. Shelter Island trailed only once at 6-4, and was able to survive a 1-for-11 shooting slump in the third quarter when both teams hit a scoring drought, combining for only 7 points. Megan Mundy had 6 assists and Haley Willumsen collected 11 rebounds for Shelter Island. Sydnee McKie Senior, a junior, was Pierson/Bridgehampton’s top scorer with 12 points. “She had the best game of her career,” said Case. Now McGayhey looks ahead to Friday with the virtual certainty that that will be the day she makes school history. McGayhey said that when that moment does come, and the game is stopped after she scores her 1,000th point, she will be emotional. A dream that is likely to come true on Friday.